Ilexus Forest is a gigantic forest located in the Syntax Estates precinct. The forest is largely dominated down low by overgrowth of Halo Bushes and up high by the gigantic canopies of the Ilexian Willows; the most dominating species of plant life in this region. The forest is a maze of pathways and trails that wind their way around various sites of interest. Many species of wildlife call this their home, as it is one of the last remaining large wildlife areas on SW Island. Animals such as the Lanturbat and the Multifly make this their seasonal home in the summer which other creatures like here year round. 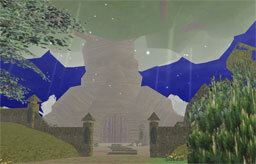 Ilexus Forest is known for its extensive cave system (Ilexus Caves) that runs underneath the entire forest. Many different entrances into the cave system have been found throughout the forest but it is believed that many others still remain. The Rage River? runs directly through the south portion of the forest. The forest is well known for being a major source of fresh water. Although the annual rainfall is very high for this region, most of it is consumed by the vegetation leaving very little for anything else. The ground water system used to be very abundant but has been tapped into by numerous wells. Along with the wells and the large cavernous gaps below the forest, the ground water table has dropped significantly leaving the wells and soil dry. There are a few clay deposits around the forest, which hold water quite well which forms ponds. Past residents of Ilexus Village are buried in this eerie cemetery. An ancient temple carved out of sandstone that is commonly known to be the main entrance to the Ilexus Caves. It was originally constructed as a religious symbol and continues to be one to a small degree. Dr. Kane Brexgata is said to be the modern discoverer of the temple; as outlined in his book Ilexus Forest Legends. 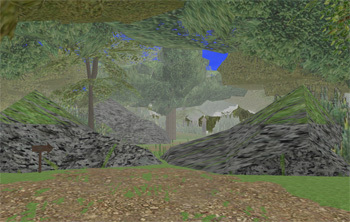 The only settlement within the forest that has residents; Ilexus Village is a medium sized settlement located in the relative center of the forest. It has most of the basic services a village should have, such as a village hall, shops (Library, Toolshop, Inn etc) and various resident housing. The south part of the village is located on the Rage River? where many residents like to fish. This massive rain-water catch serves as a backup supply of fresh water for the citizens of Syntax Estates and SW City alike. It was built in a large, natural clearing, so no forest was harmed during construction. Since the forest receives so much annual rainfall, it only takes a minimum of 1 - 2 days of good rainfall to fill up. The spill-over for the reserve has created a low-laying wetland known as the Mallard Marshlands. The Great Willow is a legendary tree that is said to be the father of all life in the forest. No modern structures such as railways or roads can be built near the Great Willow, as they always end up being mysteriously destroyed by the Willow's massive root system. The Great Willow is home to the highest concentration of Wood Sprites in the forest. To this day, many Villagers still pray and give offerings to the tree on a daily basis. The Sacred Garden, as it has come to be known, is a section of forest beautifully decorted with exotic trees, blooming flowers and stone pathways.